Our Lady’s Psalter — The Rosary. The Dominicans have an ancient tradition that the Rosary was given to Saint Dominic by Our Lady while he was combating the Albigensian heresy in the south of France, early in the thirteenth century. 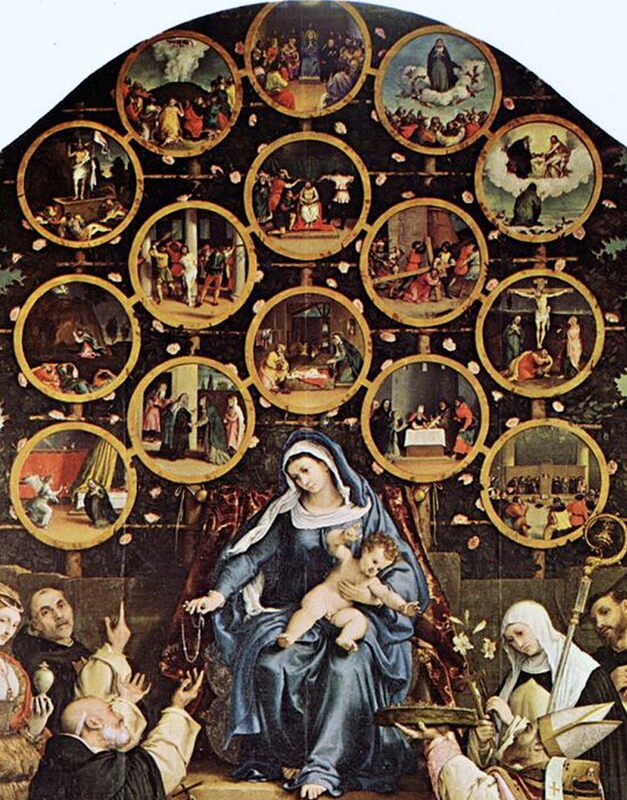 Others believe that the Rosary was in use long before Saint Dominic’s time, in the form of Our Lady’s Psalter, a series of 150 Aves said as a kind of substitute for the 150 Psalms of the Psalter. Regardless of its origins, the Rosary has proved an astonishingly effective implement of Christian piety and, as Pope Leo XIII declared, the best and most fruitful means of invoking Our Lady. Mary Herself has expressed Her predilection for this prayer, notably in Her appearances at Lourdes, France in 1858 and also at Fatima, Portugal in 1917. She prayed this form of the Psalter (rosary) with Bernadette at Lourdes and with the three shepherd children at Fatima. Mary requested it to be said everyday, at all of the apparitions.